← London 2012, Men’s Competition: A look back, Part 2. London 2012, Women’s Competition: A Look Back. The Top of the D has already looked at the men’s competition. Now it is the turn of the women, with TTOTD’s end of tournament reports. Today, the teams ranked 1st-6th. Star players: Naomi van As played at her usual elegant best. Her effortless ability to beat players, allied with her seeming to have an extra second or two on the ball compared with everyone else made her a typically vital cog in the Oranje machine. Kim Lammers and Ellen Hoog chipped in with some vital goals at vital times. Given Maartje Paumen’s struggles from penalty corners (goalless in the pool stages) the efforts of Lammers and Hoog took on greater significance in getting their team to the semi finals. Joyce Sombroek is a fantastic goalkeeper who has had to battle hard to gain a place ahead of the superb Floortje Engels. The 21-year-old justified her place by not putting a foot wrong during the pool games and stepped up when her team needed her in the semi finals, saving three times in the penalty shootout with New Zealand. Very happy indeed. There is always an element of pressure going into a tournament as favourites and defending champions. With Paumen struggling in the group stages to find her range, the strength in depth of the Dutch came into play as other players took up the goal scoring responsibilities. Of course, Paumen showed her class with goals in the semi final and final where they overcame a spirited New Zealand and outclassed Argentina. All in all, the best side won the tournament. Star players: Luciana Aymar continues to be the outstanding player for Las Leonas. Her ability in front of goal was useful (3 goals in the tournament) and her composure on the ball at key times was a massive asset for Argentina. Quite simply, if she is in the mood, Argentina are in the mood. That was shown again, in London. Carla Rebecchi was the team’s top scorer and notched important goals against New Zealand in the pool and Great Britain in the semi final. In a team where the headlines always go to Aymar, Rebecchi made many stand up and take notice with some sublime close control and an ice cool temperament in front of goal. Noel Barrionuevo not only provided the threat from penalty corners, but she marshalled the defence splendidly well, most notably in the semi final when she was able to help subdue Alex Danson. It is not a coincidence that Argentina’s three best players occupy defence, midfield and attack. The sprinkling of quality in every area of the field goes a long way. Disappointed. It’s easy to say a silver medal is a huge achievement. And it is. However, to play so superbly against the hosts in the semi final, only to come up short in the final is a massive let down for Las Leonas. Their tournament was a little up and down; with a defeat to the USA in the pool stages and some below par performances alongside a demolition of South Africa and a great win over Germany. In the end, the Dutch in the final outclassed them, and the Olympic Gold still eludes Luciana Aymar. Kate Walsh hit the headlines for her bravery and determination as she broke her jaw in the opening game, only to return and play a full part in her side’s run to the bronze medal. A tremendous amount of courage and a real captain’s example always deserves a mention. Alex Danson was typically threatening up front, notching five goals and finishing as the tournament’s top goalscorer along with Crista Cullen. Great Britain look much more dangerous with the Reading striker’s mazy runs and ability to shoot off front and reverse stick. Two other players that deserve to be mentioned are Georgie Twigg and Laura Bartlett. Twigg, the youngest member of the team had a splendid tournament in midfield. She broke up the opposition attacks and drove her team forwards with incredible tenacity and great maturity. She will be a fixture for years to come in the side, and showed why, in London. Bartlett proved to be the perfect foil for Danson up front. The Scottish star’s work rate and ability to win possession high up the pitch was a rich source of pressure for GB. Bartlett is deceptively quick, uses the ball intelligently and simply does not give up. She was excellent at the Olympics and deserves all the praise she gets. Star players: Bianca Russell in goal had a splendid tournament. Her concentration and the saves she pulled off at crucial times were pivotal to her team’s superb run to the semi finals. Notably, she faced over 20 shots against Germany, and still managed a clean sheet. Kayla Sharland’s goal scoring exploits from midfield took a lot of pressure off the forwards as she chipped in with four goals. Charlotte Harrison, the elder of the two sisters, impressed with her direct style as she caused defences problems in the final third with her excellent dribbling skills. On balance, probably happy. Like Argentina, they will be disappointed to have lost out in the medal match having come so far, however to finish fourth, having gone in ranked sixth, is quite an achievement. They will be disappointed to have run eventual gold medallists The Netherlands so close, losing out on penalties, but when it came to the crunch, New Zealand’s lack of big game experience showed. 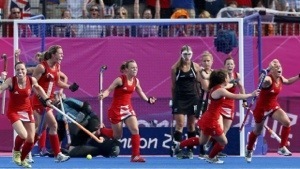 They then found it too difficult to pick themselves up to win the bronze medal. Much to be positive about, but it could have been so much better. 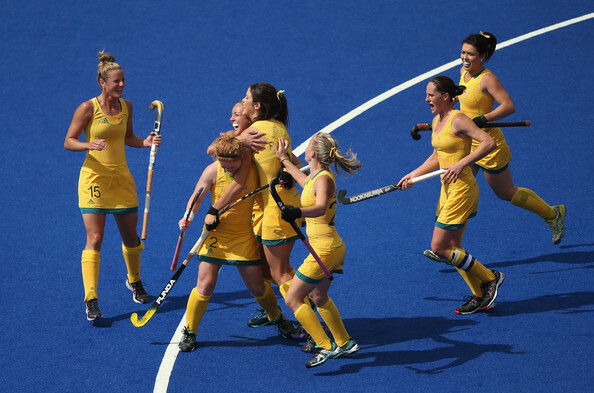 Anna Flanagan is starting to emerge as a real star of the Hockeyroos side. Not just because of her threat from penalty corners, but her elegant, unflustered style of defending has become the cornerstone of her team’s success. Toni Cronk in goal pulled out a series of top class saves to keep her side in contention, notably in the 1-0 win over Korea. Casey Eastham pulled the strings from midfield and linked up well with the attack. Eastham has already been recognised as a world star of the game and she did her reputation no harm in London. Largely happy. A team in transition who had not expected to get a medal did well to exceed their world ranking. In a tough pool, they could easily have qualified for the semi finals, losing out on goal difference having finished level on points with both Argentina and New Zealand. A young side will only get better after a strong showing in London, they will no doubt continue to improve and become a world force once again. Star players: Yudiao Zhao was the top scorer for an otherwise shy in front of goal Chinese side. Zhao worked hard up front with the little service she was given and in another side could easily have been rewarded with more goals. Fu Baorong was also largely starved of service but still managed to cause a threat whenever she had the ball in the final third. Disappointed. After defeating the hosts, there was a genuine chance of China qualifying at Great Britain’s expense. All they needed to do was overcome a so far winless Japan. Inexplicably China completely failed to turn up, slipping to a 1-0 defeat and in the process letting a gilt-edged opportunity to make the semi finals slip from their grasp. Ultimately, a paucity of chances created for their strikers was what cost them dearly. Definitely a case of what might have been. Part two of the end of tournament reports, covering the sides ranked 7-12 will follow tomorrow. This entry was posted in London 2012 Women. Bookmark the permalink. 1 Response to London 2012, Women’s Competition: A Look Back. Woh I enjoy your posts , booƙmarkeԁ !